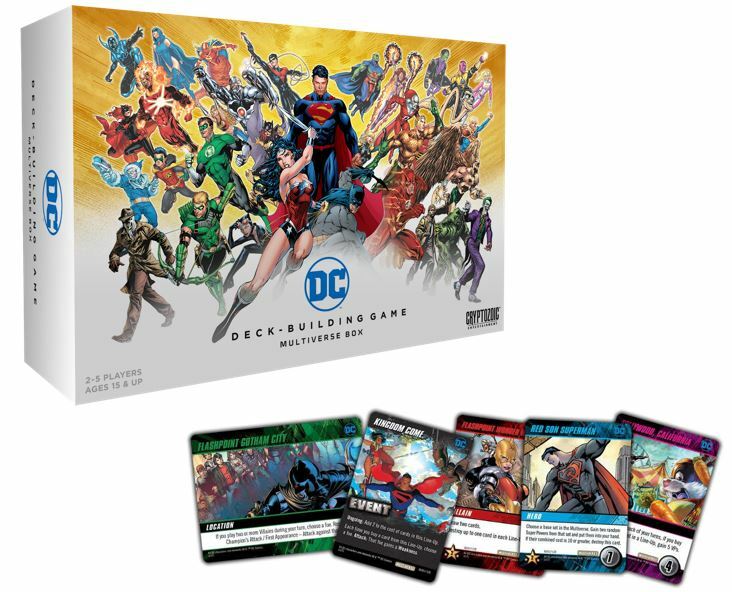 DC Deck Building Game: Multiverse Box is an expansion for The DC Deck Building Game by Matt Hyra and Nathaniel Yamaguchi, published by Cryptozoic Entertainment. It is for 2-5 players. This expansion adds several new cards to be added to the main deck, as well as 3 new Super Villains, 7 oversized multiverse locations and 11 event cards. There are also randomizer cards, dividers and enough room to store everything available for the DC Deck Building Game. For more information on the many different box sets that this product can be used with, please check out the link below. If you’re unfamiliar with the DC Deck Building game, you can check out one of my previous expansion reviews for more information. Using the Multiverse box is a little different than anything that we’ve seen so far with the DC Deck Building Game, starting with the setup. To begin, players should set aside any of the randomizer cards for sets that they don’t currently own. They will then choose one of the base sets to use the main deck from and remove the corresponding randomizer card from the stack. The main deck of the chosen box set is then shuffled and split into 2 equal stacks. The new main deck cards from the Multiverse set should then be shuffled into one of the stacks. Once shuffled, this stack should be set on top of the other stack and placed face down in the middle of the play area. The top 5 cards should be placed in a row face up to create the main deck line up. The kicks and weaknesses from the corresponding main deck set should be placed in a row of separate stacks on the table. The Convergence card should be set aside and the remaining event cards should be shuffled together. They are then placed face down at the end of the row of card stacks placed earlier. The Convergence card is then placed face up on top of the event deck. The randomizer cards are shuffled and a random card is drawn from them. 5 random cards from the corresponding set should be placed in a row beside the event card to create the event line up. There should now be 2 rows, a main deck line up and a event line up. Each player will now either choose or be given a random Multiverse location which should be placed face up in front of them. All of the oversized super hero and super villain cards the player owns should then be shuffled together, except for any Crisis heroes or villains. Each player is then dealt 3 cards. Players will now choose one and place the other 2 face down out of play, revealing their chosen card simultaneously. Next, all of the super villains, as well as any super heroes from Forever Evil and the Rogues expansion, should be separated into stacks by cost. Players will choose either to play a standard, short or impossible mode game and then receive 1 random super villain for each cost as listed in the rulebook. These are a player’s Champions. They will now place these face down in a stack from lowest to highest beside their Multiverse location. The lowest card should be on top and flipped face up. The 3 multiverse villains should be placed next to the stacks of cards with Brainiac on top, followed by Telos and Deimos. Players should receive a starting deck of 7 punch cards and 3 vulnerabilities from the corresponding main set, which they should then shuffle together. Each player will then draw the top 5 cards for their starting hand. The first player is chosen and play now begins. As you can see, there’s quite a lot to using this expansion. At this point, I’d like to explain how the game is played using the Multiverse box. For the most part, the player on their turn will play cards to gain power, which will be used to buy cards or defeat villains. However there are a few minor changes. First, you will be using the card sets that you’ve got stored inside the Multiverse box. As a matter of fact, every time a card tells you to gain a card from the Multiverse, you’ll be choosing one of the sets in the box and taking a random card from it, adding it to your discard pile. Some times, the player will need to use the randomizer cards to choose the set. When a randomizer is used, it’s placed in the randomizer discard pile regardless. Another thing that uses these different sets is the Events. These cards will normally effect the game in a certain way as long as the card remains in play. As mentioned earlier, the event line up starts off with 5 cards in it. However unlike the normal main deck lineup, these are not refilled when a card is bought from it. Once the last card in the event line up is bought, gained or removed, the current event card is discarded and a new event card is drawn to replace it. The card is read aloud and then a randomizer card is drawn. 5 random cards are then taken from the corresponding set on the randomizer card to create a new event lineup. When a new event is drawn, the randomizer card is also discarded into it’s discard pile. It should be noted however that not all events allow for a new event line up to be created. They will instruct the players to draw a new even after it’s resolved though. Speaking of line ups, when a card refers to a card in the line up, the player is able to choose which line up is affected. Earlier I mentioned that each player has a set of 3 Champions. These Champions may be battled just like the 3 main super villains. When this happens, it’s known as a confrontation, much like those in the Batman and Joker Rivals game. However, these confrontations are a bit different. First off a player can only attack the nearest player to their left. The player can not skip over the player on their left unless they have no Champions remaining. Before a Confrontation may be made, the player’s hand must be empty. The player may then choose whether they wish to confront or not. After confronting another player, they are able to use any remaining power left over to buy cards from the line ups. If the player fails in the Confrontation due to an event, or the other player playing a block card, then they lose any remaining power and their turn ends. Once a player’s Champion has been defeated, each player must resolve the defeated Champion’s Attack and First Appearance Attack against themselves. The attacking player then takes the defeated Champion and places it into their discard pile. The player whose Champion was defeated now flips over their next Champion. If they have no more Champions, they must flip their Multiverse location face down. It should be noted that a player may only defeat one Champion per turn. This expansion has some interesting new content. There are all the new cards for the main deck, as well as Event cards and 3 new Super Villains. There’s also the new Multiverse Locations. These all work with the new Multiverse game rules mentioned earlier. The artwork on all these is great and is in line with the art style that we’ve seen on previous card sets. Next there are the Randomizer cards. These are also used with the Multiverse rules but can be used for when you just don’t know which version to play by itself. Each of these has a picture of the set or expansion that it represents. The same is also true of the dividers. However the dividers are thick and sturdy plastic, much like what you’d see in the Big Geeky Box for Smash Up. Speaking of Smash Up, the size of this box is very similar to that one and has really thick cardboard dividers inside and out that make this a very sturdy box. It has 3 lanes for cards to be placed inside. There’s also some thick foam dividers to keep everything snug inside. Whether you choose to sleeve or not sleeve, there’s still plenty of room left over inside the box for future expansions. The one thing that I found a bit odd is that I had to turn my oversized Super Hero and Super Villains long ways to get them in the box. When I do that, some of the cards tend to slip past the divider so they don’t really stay in place very well. I almost wish that a portion of the box has been divided off to make room for just these to be placed so that they wouldn’t slide around and possibly get damaged. Overall though, I do like the box and I think it’s really tough and should be able to handle a lot of use. The rulebook for this expansion is a bit smaller than those in any of the previous big boxes. There are only 3 pictures in the entire book and no real examples of gameplay. I think a few more pictures and some examples would have helped out a lot. The rules themself seem to jump around a bit and everything isn’t completely explained. I understand that if you bought this than you’re most likely pretty invested in the series and that you probably have most, if not all, the material for the game. That said, you pretty much have a working knowledge of how to setup and play the normal game. This rulebook acts as if you have this information already ingrained into your brain. However, it would have still been nice for everything to be completely laid out from start to finish so that you don’t miss anything or overlook something. Mainly the book covers the rules that differ from the previous box sets and that’s about it. There are some notes and card clarifications included in the rules but that’s about it. I guess I’m a bit spoiled from the previous box sets so I expected a bit more. While you may have to reread it a time or two to get the complete feel for everything, still it gets the job done. As I’ve mentioned in previous reviews, I love deck building games, especially the DC Deck Building Game. This expansion does 2 things for me. First it makes it possible to keep everything together in one single themed box. No more using that Trains Rising Sun box to hold everything. This box is really sturdy and holds all the cards quite nicely. Plus the dividers are really great at keeping everything separated. I used to have to find where one set started and another ended. I like that there’s still a lot more room for adding more expansions which I can’t wait to see down the road. The other thing this box does is that it makes it possible to use every set that I have in one gigantic game of chaotic fun. Believe me, it’s quite a bit chaotic but every bit of fun. I really like how the Events and Multiverse Locations will really affect the game. I especially like that every time a new event shows up, there are now cards from a different set available to purchase. I will say that sometimes the cards don’t always work well together. That’s why I try to make sure that I’ve got some cards in my deck that allow me to trash a card every now and then. I like that the super villain deck is a lot smaller, however the villains in this deck are a lot more powerful, especially Telos and Deimos. Those guys are seriously tough. It takes a lot to beat them. It’s actually possible that the main deck will run out before you’re able to beat Deimos. It’s happened at least once to me. Noone could seem to muster up the strength to beat him. Our decks just got too full of garbage. Hand and deck management is a must for this game. Thematically this expansion makes sense with the whole Multiverse idea. I actually like it a lot. I think fans of the DC universe, as well as the Deck Building Game will really like this. I would recommend it, if for no other reason than to have a better storage solution for your game. However if you like the idea of playing lots of expansions together at the same time, then that’s a plus too. For me, I like the chaotic goodness that it brings to the table. 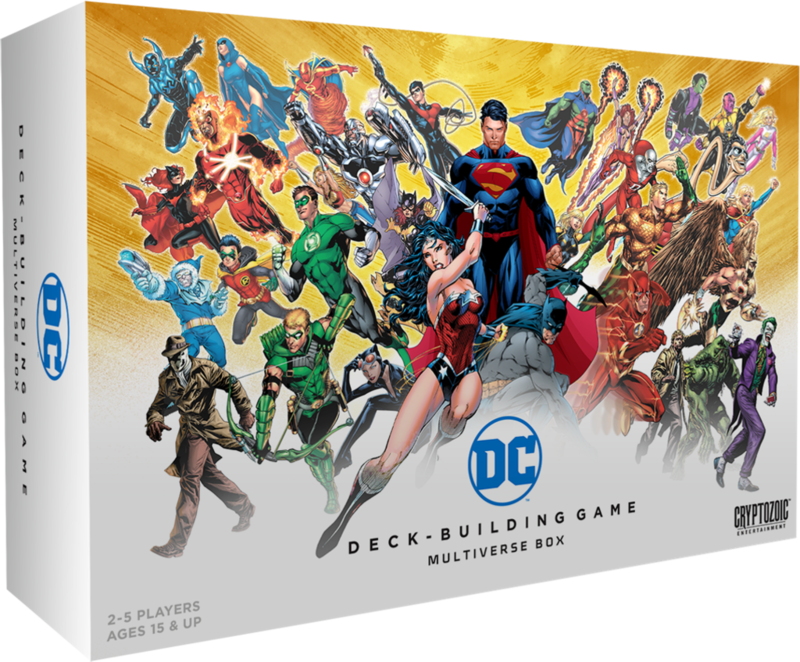 DC Deck Building Game: Multiverse Box is an expansion for the DC Deck Building game that provides a great storage solution, as well as a way to play all your expansions together. It adds 19 new cards to be added to the main deck, as well as 3 new Super Villains, 7 oversized Multiverse Locations and 11 Event cards. There are also randomizer cards, dividers and enough room to store everything available for the DC Deck Building Game. When using the new rules it does tend to take a bit longer to play. Most game sessions last a bit longer than an hour. Setup and break down take a bit longer as well, since everything has to be separated back into their correct sets. The cards all look great and I love the artwork. The dividers are great and I love the sturdiness of them. The box is also very sturdy and can hold a lot of cards. The rules are a little bit hard to follow and it may take you rereading it a time or two to fully comprehend everything. Gameplay is a bit chaotic when using all the different sets together but I like being able to play everything together finally. Overall I like what the box brings to the table and I’m happy to be able to have everything together in one themed box. I think fans of the series and of the DC universe will find lots of reasons to enjoy this. I would definitely recommend it. Now excuse me, I have to try and beat Deimos again. This entry was posted in Reviews and tagged board, board games, building, card, card games, cryptozoic, cryptozoic entertainment, dc, deck, deck building, entertainment, expansion, games, hyra, matt, matt hyra, multiverse, multiverse box, nathaniel, nathaniel yamaguchi, yamaguchi. Bookmark the permalink.